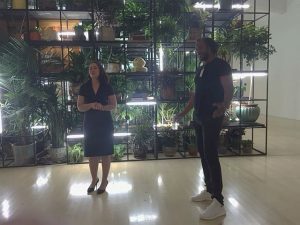 “Rashid Johnson: Hail We Now Sing Joy” is worth the drive across Illinois’ northern border. Up now through early fall at the Milwaukee Art Museum, the most current works of Johnson are monumental. More often than not, an exhibit features works large and small. And Johnson, a Chicago native and New York-based artist, has worked with a variety of formats from photography to installations. Many of those works were in a 10-year retrospective at Chicago’s Museum of Contemporary in 2012. 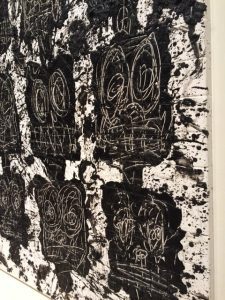 Now, isitors to the MAM show are likely to get the message of how Johnson, a black artist who grew up in Evanston and studied at Columbia College Chicago and the School of the Art Institute, views the world today. They are immediately aware upon entering the exhibit that this time Johnson is thinking large scale. The first gallery is dominated by a 10-foot high black scaffolding that is overflowing with plants in hand-built ceramic pots, small shea butter sculptures, books, a video, an upright piano and lights. A gallery is covered with the faces of the “Anxious Audience” pieces made with wax on black soap backed by ceramic tiles. Titled “Antoine’s Organ,” the piece is Johnson’s nod to the African Diaspora but the work is named for Antoine Baldwin, a pianist and music producer. Musicians will be up in the grid of scaffolding periodically to play the piano. Faces, all looking as if they were inspired by Edvard Munch 1893 painting, “The Scream,” look from the walls in the “Anxious Audience” gallery. Made with wax on black soap backed by white ceramic tiles, the faces seem to reflect the racial violence and conflicts in the news. Colorful paintings, all titled “Escape Collage” offer a hopeful view of tropical warmth. 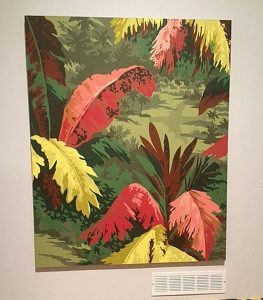 works, made from custom wallpaper appear to have black smudges that may be figures entering a colorful, tropical world of multicolored tiles and paint. Johnson has said he equated palm trees with success because they meant being able to leave a cold climate for a tropical one. Johnson leaves it up to the visitors to interpret the meaning of the butter although Shea is often thought to be soothing and even a balm. 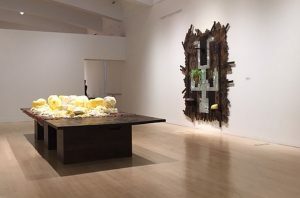 Table with blocks of Shea butter surrounded by “Falling Man” art work. However, all the works on the walls of this gallery are called “Falling Man.” They are made with red oak flooring, pieces of mirrors, black soap, wax and white ceramic tiles. Although the figures resemble video game people, the pieces’ titles of “Falling Man” beg other interpretations such as violence or unsuccessful economic ventures. 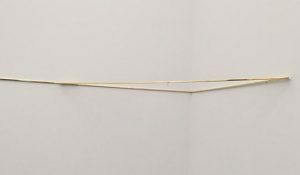 Viewers should find Johnson’s work relevant now and reflective of the past given that art through the ages has historically reflected the times when created. 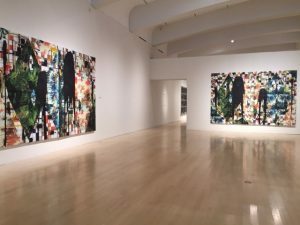 “Rashid Johnson: Hail We Now Sing Joy” is at the Milwaukee Art Museum, 700 N. Art Museum Drive, Milwaukee, WI 53202, now through Sept 17, 2017. For admission and hours call (414) 224-3200 and visit MAM. It’s likely no surprise to art aficionados that an extraordinary exhibit has opened at the Art Institute of Chicago this summer. But a great institution does more than collect. It investigates well-known works were created and why and also presents new and lesser known works. There was “Seurat and the Making of ‘La Grande Jatte’ ” back in the summer of 2004 which revealed other figures in the famous painting and included related sketches and paintings. 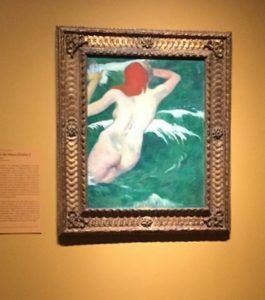 Then there was “Matisse: Radical Invention 1913-1917” in spring of 2010 which revealed new information about “Bathers by a River -1909-1910” found through technical research. It also offered a more in-depth view of the artist’s works. More recently, the museum focused on the paintings: “Van Gogh’s Bedrooms” which were researched and compared in order to shed more light on the artist and his time in Arles. Visitors at that exhibit in 2016 may remember that Van Gogh set aside a room for Gauguin whom he greatly admired and hoped would help start an artists’ commune there. Now the museum is turning its spotlight and technical research onto Gauguin. The resulting exhibit sheds extraordinary light onto an artist who is much more than a painter particularly fond of Tahitian figures. Go to the Art Institute of Chicago to see some fascinating paintings of Breton and Tahitian women or of Martinique landscapes by Eugène Henri Paul Gauguin. 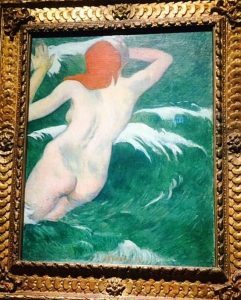 Gauguin, 1889 “In the Waves (Ondine I), oil on canvas. Or go to the museum to see extraordinary ceramics by Gauguin. He called them his “monstrosities. They really aren’t. Or go the museum to see Gauguin’s fine prints and woodwork. But no matter what you expect to see in the Gauguin exhibit now at the Art Institute of Chicago through Sept. 10, 2017, you will be astonished. What you will see are images that may start as drawings or be used on a ceramic piece and end up in paintings. You will also see decorative art. But also look up on the walls. 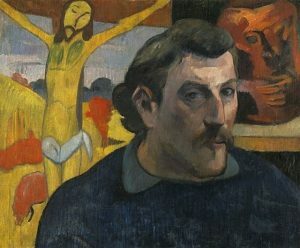 There are quotes by Gauguin that offer insight into the man, the painter, the philosopher, the traveler and the artist who influenced other artists. So don’t hurry through the exhibit. “I must work seven or eight months at a stretch absorbing the character of the people of the country, which is essential for good painting… You must remember that I have a dual nature,” says a quote high on one of the exhibit walls. Look for objects including furniture that Gauguin decorated. Also take time to watch some of the videos that show how the artist worked with different materials. A short movie near the entrance talks about trying to define Gauguin’s style and changing focus. It offers more insight into the artist and his works. So, it is very likely that what “Gauguin: Artist as Alchemist” does for viewers is introduce them to an artist they only thought they knew. The Gauguin exhibit at the Art Institute requires tickets. Tip: get the ear phones available near the exhibit entrance. They are quire helpful. The exhibit will go to Grand Palais in Paris in October 2017. The Art Institute of Chicago is at 111 S. Michigan Ave., Chicago, Illinois. For ticket and other information call (312) 443-3600 and visit AIC. It’s that time of year again when shirt-sleeve weather encourages folks who want something interesting or fun for the abode to check out area art fairs and festivals. Art Fair season is here. Enjoy! 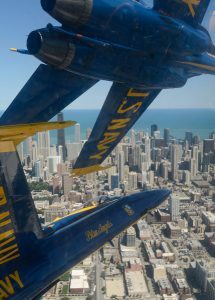 For Father’s Day weekend, two really big fairs may tempt Dad or at least get people strolling around Grant Park and downtown Evanston. 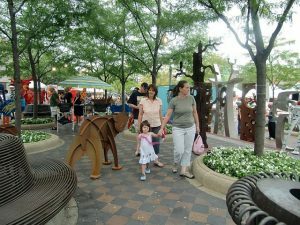 The mega Gold Coast Art Fair takes over Grant Park from 10 a.m. to 6 p.m., Saturday and Sunday. Operated by Amdur Productions, it is among the top fairs in the country attracting about 300 juried-in artists. For other information visit Amdur. Also this weekend the Annual Custer’s Last Stand sprawls across Evanston’s Main Street-Chicago Avenue area with about 375 artists. Sponsored by the Evanston Festival Theatre and the Illinois Arts Council, it goes from 10 a.m. to 9 p.m. For other information call visit CusterFair or call (847) 328-2204. If this weekend doesn’t work or more exercise is desired, the Randolph Street market is at 1340 W. Washington St but spills over surrounding streets with about 300 vendors. It goes from 10 a.m. to 5 p.m. The next market is the last weekend of July. For other info visit Randolph Street Market. 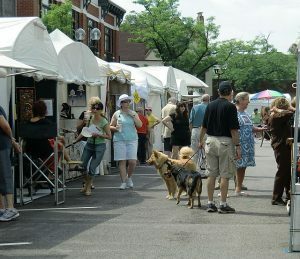 Back in the northern burbs, the Art Center of Highland Park holds its annual Festival of Fine Arts at the northeastern end of the suburb’s downtown on Sheridan Road south of Central Avenue. the fair goes from 10 a.m. to 5 p.m. See Festival of the Fine Arts. There’s another place to put on the must see list when visiting the Art Institute of Chicago. Tourists and regular Art Institute goers often have a must see stop when visiting the famed museum. Some visitors head to the French Impressionist galleries while others go to the Modern Wing. The Thorne Miniature Rooms are also a draw as are such works as Edward Hopper’s “Nighthawks” in the Modern American galleries that lead to Regenstein Hall’s special exhibitions. Up on Level 2, a darkly mysterious archway sets a “Game of Thrones” tone as visitors step back in time in Galleries 235-239. Vaulted ceilings are reminiscent of chapels and great halls that once held the objects. “Ayala Altarpiece,” a 24-foot funerary chapel altarpiece from 1396 dominates the first room. 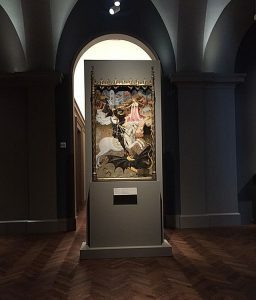 “Saint George and the Dragon” is further along in another vaulted gallery. 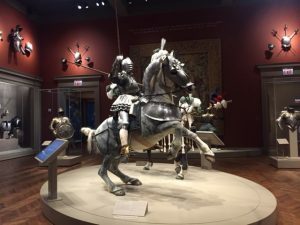 The great hall at the end of the space beckons with its impressive armored horseback riders but the galleries leading up to it are worth perusing. They offer clues on how some people lived from jewelry to art and dining. After first walking through an arms-filled rotunda, patience is rewarded as visitors ooh and ah when stepping into the great arms and armor hall. An armored horseback figure is ready to battle but look behind him. Another rider is dressed for sport. Snap the photos then gaze around and up. Two figures are battling on foot. More arms are displayed high above the figures. There is one more gallery. It features fine firearms and hunt equipment. Visitors who don’t go through too quickly will see digital labels that are there for an interesting, interactive experience. The Art Institute of Chicago is at 111 S. Michigan Ave., Chicago. For hours, admission and other information call (312) 443-3600 and visit AIC. 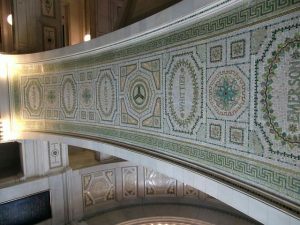 The Chicago Cultural Center is an art destination in its own right if only for the gorgeous tile work at its Washington Street entrance and staircase or for its two spectacular glass domes. Gorgeous tiles line the staircase and walls of the Chicago Cultural Center at the Washington Street entrance. But there are always interesting art exhibits in its galleries on the first and fourth floor and sometimes on the second floor so when downtown Chicago make the Cultural Center a must-see stop. Go up to the fourth floor’s Sidney R Yates Gallery now through June 25, 2017 to be amazed at how doors can look when painted by an artist. 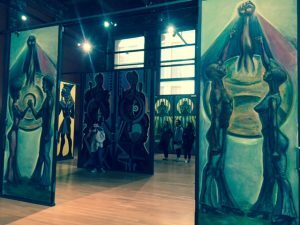 Done by Eugene Eda for Malcom X College in 1971, 32 spectacular doors stand tall representing the Black Art Movement of that period. Imagine doors as artistic as these gracing the stairwells of a college. If interested to learn more about the doors and the artist stop in on June 14 at 12:15 for curator Daniel Schulman’s Gallery Talk. Curated by Terry Myers, the exhibit is the first institutional showing of this Chicago artist. The broad patches of color in some of her works reflect the Puerto Rican influence of her parents’ roots. Her work is also narrative. Alvarez’s work is up through Aug. 6, 2017. Down on the first floor, walk along the western corridor to view “The Pride and Perils of Chicago’s Public Art.” Up through July 30, 2017, large photos and accompanying descriptions depict old statues and contemporary mural in different neighborhoods. Chicago has designated 2017 the Year of Public Art. Candida Alvarez “Buena Vista” at Chicago Cultural Center. The building stretches from Randolph Street to Washington Street along the west side of Michigan Avenue. Elevators on the Randolph side go up to the Fourth Floor galleries. The staircase on the Washington side goes up to the Tiffany Glass Dome. For more information visit City of Chicago exhibits. Appearances are deceiving would be a good warning when walking into “Smoke, Nearby,” the gallery at Museum of Contemporary Art Chicago currently exhibiting works of Mexico City-based sculptor Tania Peréz Cordova. Her works are not meant to be looked at in passing. They require more than a glance at something mounted piece before going on to a work displayed on the floor. If you’re a fan of legendary rockers Mick Jagger and Keith Richards and their Rolling Stones band you needn’t ask why go to Navy Pier to see Exhibitionism. An all encompassing retrospective, the traveling show that opens April 15 and goes through July 30, 2017, has rooms of costumes, films, posters, art, recordings, instruments and personal paraphernalia, that are likely to bring back memories of concert tours and albums. 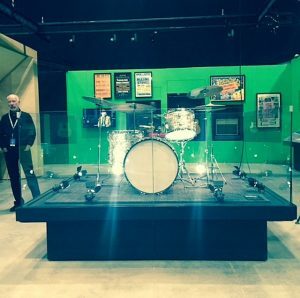 But even if other bands have had you screaming and shaking, the exhibit is still worth seeing as a cultural and musical phenomenon that goes back to the 1960s and continues in the 21st century. A British export that is a combo of blues and rock ‘n’ roll, the band was inducted into the Rock and Roll Hall of Fame in 1989 and the UK Music Hall of Fame in 2004. But they proved they could still draw crowds with their record breaking concerts: Voodoo Lounge Tour in 1994–95 and Bridges to Babylon Tour, 1997–98, to their Licks Tour in 2002–03 and A Bigger Bang Tour, 2005–07. 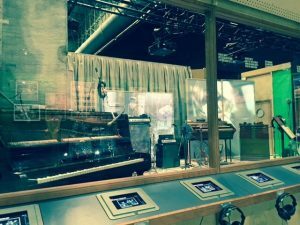 Band recording studio in Exhibitionism show. But where some visitors may be snapping photos and selfies is the fashion gallery of impressive costumes. They’re devilishly wild and what would be expected of the Stones. Save time to watch the films that include a concert near the exhibit’s end. 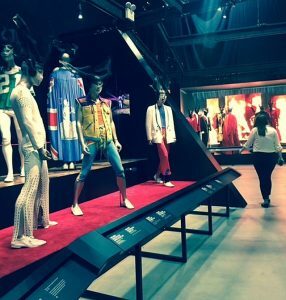 Rolling Stones costumes in Exhibitionism at Navy Pier. Details: “Exhibitionism is at Navy Pier, 600 E. Grand Av., Chicago, April 15 to July 30, 2017. For tickets and other information visit Stones Exhibitionism.